DFNY is partnering with My Dog Votes to get out the dog vote. In addition to registering new voters, we are helping voters identify dog-friendly candidates for local and state-level office. Your dog is depending on you to vote dog-friendly. Feel free to download, copy, and distribute the checklist pictured above at your next club meeting, next class, next day at work or your next trip to the store. Join us in supporting candidates ready to work with caring owners who want dog-friendly, dog-safe communities. Ask your candidates where they stand on the issues! Find out who will stand up for us on pet limit laws, insurance discrimination, breed specific legislation, forced spay-neuter and other anti-dog, anti-dog owner measures! ! Attention elected representatives and candidates in New York ! Close to 45% of households in New York include a dog. In many localities that percentage is doubled. "Dog issues" cut across party lines, and emotions run high when treasured family members and workmates are threatened. In a recent poll a resounding 92.9% of likely voters indicated that they would cross party lines in local or state elections to preserve their right to own the dog of their choice. Would elected officials be wise to court the "dog vote"? The Dog Federation of New York thinks so. 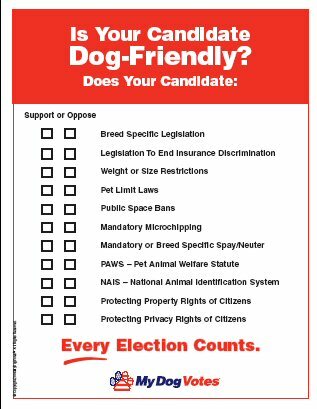 (please note: We make the copyrighted "Is your candidate dog-friendly" flyer available with the permission of the owner. Please do not alter it in any way.